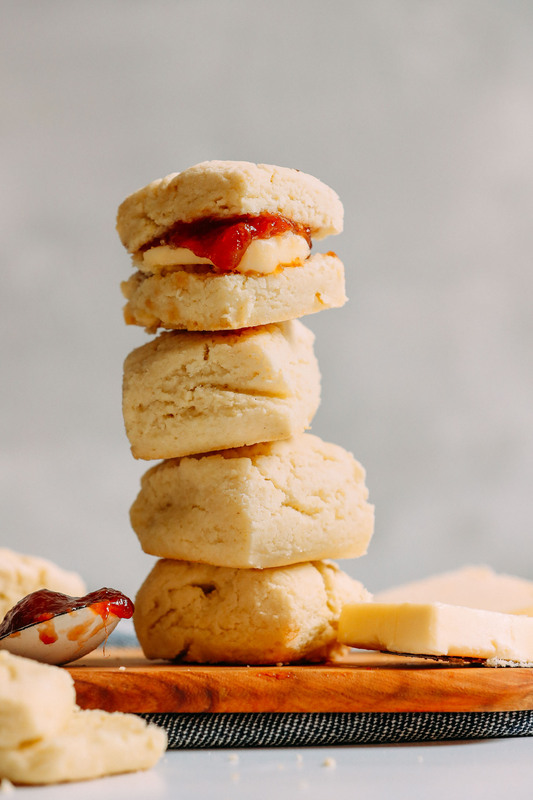 Since then, I developed a recipe for Vegan Gluten-Free Shortcake, and in doing so I realized it wouldn’t be much more work to nail the biscuit version down. So that’s what I did. And this (new and improved) recipe is easy, requiring just 8 simple ingredients, 30 minutes, and 1 bowl to make! 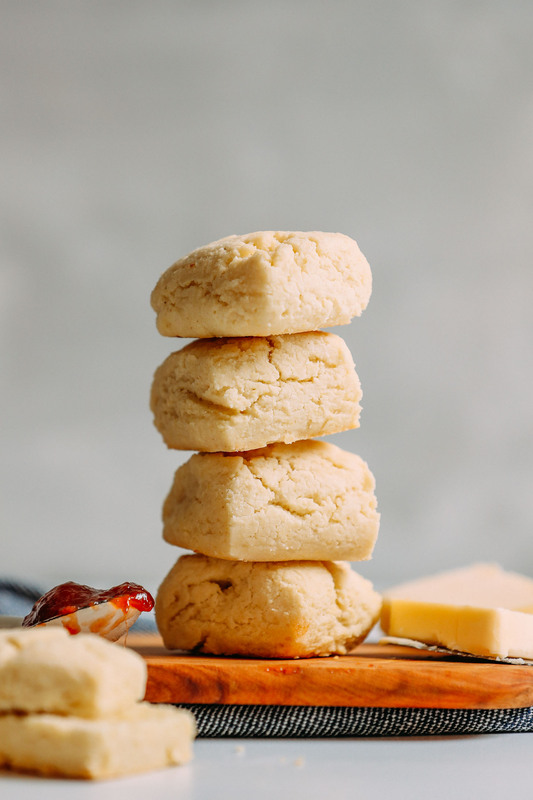 The base of this biscuit is a blend of potato starch, almond flour, and cornstarch, which provides a neutral flavor and light, fluffy texture (which is key in biscuits!). Salt adds flavor, baking powder helps them rise, and nutritional yeast (optional) adds a little more flavor. Next comes vegan butter, the fat necessary to create a “flaky” biscuit. Don’t skimp on the fat, folks! Last but not least is light coconut milk, which provides enough moisture to make a dough. Canned coconut milk is best here! Trust us. We tested others and they didn’t make as delicious of biscuits. Once you achieve a tacky dough, you’re ready to shape and cut out your biscuits! Just a short bake in the oven at a high temp and voila! You have fluffy, tender, gluten-free, vegan biscuits on your hands! Yes, it’s that simple. 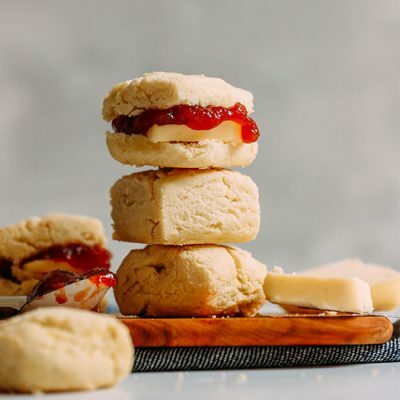 These vegan, gluten-free biscuits are delicious with vegan butter and jam, compote, or even maple syrup. For a savory version, try topping them with Macadamia Nut Cheese and roasted or fresh vegetables. Plus, they make the perfect companion to things like Veggie Chili, Tomato Soup, and Gravy! Into biscuits? Check out our Vegan Pumpkin Sage Biscuits, Vegan Cheddar Jalapeño Biscuits, and our original Best Damn Vegan Biscuits! If you try this recipe, be sure to let us know! Leave a comment, rate it, and tag a photo #minimalistbaker on Instagram. Cheers, friends! *UPDATE: Recipe was updated and republished on 9/6/18 with new photos and adjustments for improved texture and flavor. Fluffy vegan biscuits made with the perfect blend of gluten-free flours for the ultimate tender, buttery biscuit! Just 30 minutes and 1 bowl required! Preheat oven to 400 degrees F (204 C) and set out a baking sheet. 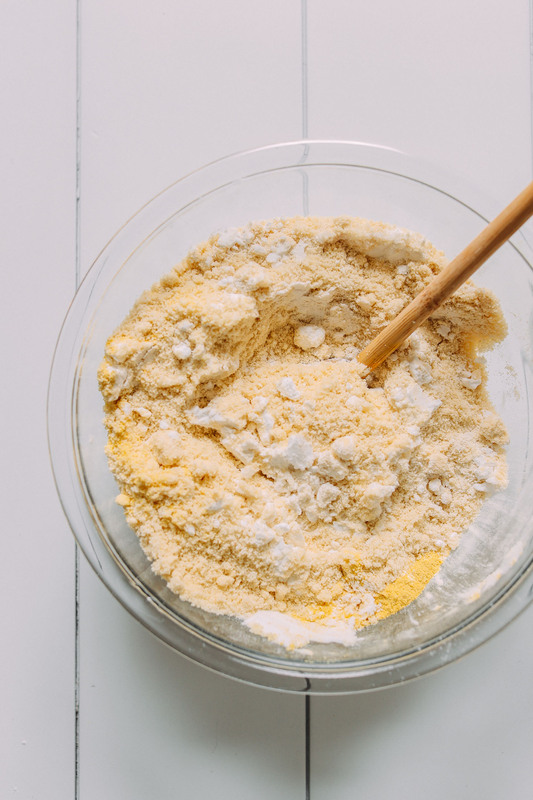 To a large mixing bowl, add potato starch (not flour), almond flour, cornstarch, sea salt, baking powder, cane sugar, and nutritional yeast (optional) and whisk to combine. Add vegan butter and use a pastry cutter, whisk, or fork to "cut" the oil into the flour until small bits remain (see photo). (We tried using coconut oil and while it did work, vegan butter yields a much fluffier, more tender, flavorful biscuit). Add the light coconut milk to the dry mixture and gently stir with a spoon to combine. You're looking for a semi-sticky dough and you may not use all of the coconut milk. If it looks too wet, compensate with 1-2 Tbsp at a time of almond flour or potato starch. Add more coconut milk if it is too crumbly. 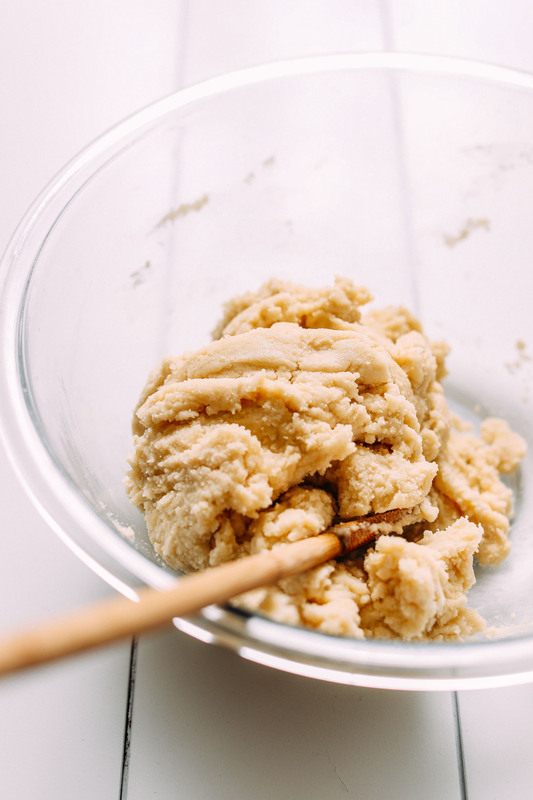 Transfer your dough onto a well (gluten-free) floured surface and dust the top with a little potato starch or almond flour. Handling as little as possible, form into a 1-inch-thick disc with your hands (these biscuits don’t puff up as much as their gluten-containing cousins, so only push the dough down as much as you desire them to be thick). Then, using a well-floured biscuit cutter, small cookie cutter, or narrow drinking glass, cut out biscuits and transfer carefully to a baking sheet with a spatula. Arrange the biscuits so they are close but not touching - see photo). 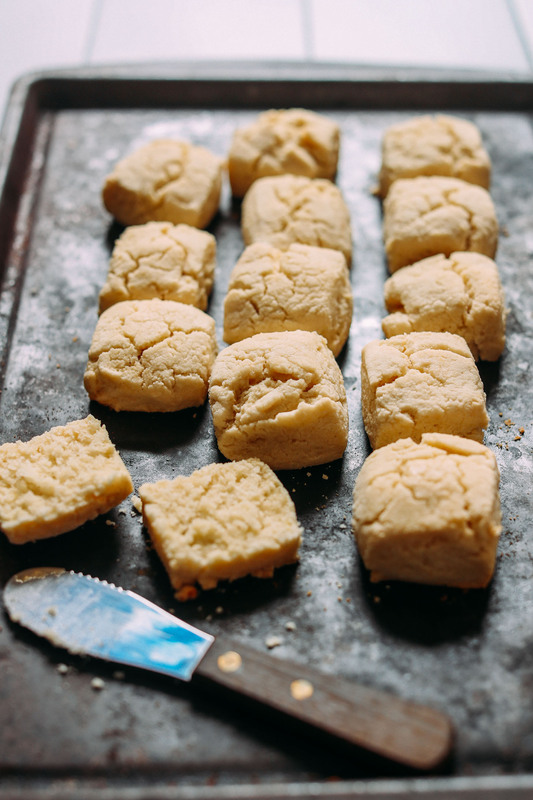 Continue, reforming dough as needed, until all of the dough is used (as the recipe is written, about 12-14 small biscuits or 6-8 medium biscuits). 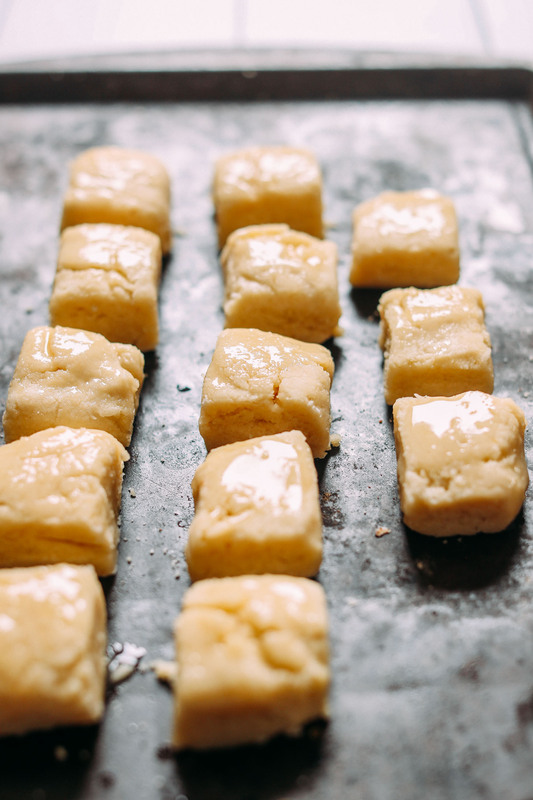 Brush the tops of the biscuits with melted vegan butter (optional). Bake for 14-18 minutes or until they look dry and fluffy. Watch carefully and be sure not to burn. Remove biscuits from oven and let rest on pan for 10 minutes. Then transfer to a serving plate. Warm or room temperature is best for serving. Best when fresh. Store leftover biscuits covered at room temperature for 3-4 days or in the freezer up to 1 month. Reheat in a 350 degree F (176 F) oven. These would go well with vegan gravy, and are especially delicious with a little vegan butter and jam or compote! *Nutrition information calculated with optional ingredients and without serving ingredients (vegan butter or jam). Hi, I made these, kinda, I used the same flours, but used almond milk and coconut oil. There were quite OK, I had to add much more milk to make a somewhat sticky dough. I would not use 1 tsp salt but 1/2 tsp instead. I cannot figure out what I did wrong, but this didn’t work for me. The end result tasted like burned mashed potatoes. The texture was fantastic, but the flavor wasn’t right. I didn’t sub out anything. Happy new year Dana, love your recipes. Did this but using lactose free milk and the the 1to1 flour from Bob Mills, it was just perfect!!!!!!!!!!!! So long since I could enjoy a biscuit. Just love it. Will try it with coconut milk. Thanks for sharing. Just made these with Bob’s Red Mill 1 to 1 glten-free flour instead of the potato starch and kept everything else more or less the same (my coconut milk was full-fat and dense so I ended up adding some water). The biscuits turned out great when they were hot but sandy and far too hard as soon as they cooled. Any tips? These look SO good! Do you think I could use tapioca starch in place of the potato starch and have the same result? I’m unfortunately allergic to potatoes. Hi Jessica! We haven’t tried with this recipe and can’t say for sure but if you experiment with it, report back! Good luck! These look amazing! I want to make them now but don’t have potato starch. Any recommendations to substitute? Doesn’t have to be gluten free. Thanks! I am planning to use these biscuits to top my Vegan Fall Pot Pies for family Christmas celebration this weekend. My game-plan was to make the pot pies a day ahead and freeze them. I see that these are freezer friendly after being baked. Is it okay to freeze prior to? Thanks in advance for the advice! Oh to be vegan and allergic to coconut. Anything I can substitute for the coconut milk? THESE MAKE ME SO HAPPY. I made them with ghee instead of vegan butter, eliminated the sugar (gives me wicked migraines), opted for the nutritional yeast and they are SO GOOD. THANK YOU! I haven’t had a biscuit in years. Thank you, Dana, for putting in the work to figure out how to make these magical doughy beings come to life! I just made these. I used regular butter and they turned out amazing! Delectable delights! These were great! Thanks for a gluten-free recipe that has an easy to find substitute for flour. My favorite six-year-old who is allergic to wheat and rice (so lots of gluten free flours are not good for her) loved them! She was so excited to get to have biscuits. I made a half batch which made four small biscuits since this was an experiment. Pressed the dough to about 1.5 inches high and then just cut into four squares. One last opinion, I think 1 tsp of salt is too much for this recipe. Next time I make them, I’ll have the salt since the Eart Balance butter I use is pretty salty on it’s own. I’ll use the potato starch instead of my tapioca starch substitute too. Otherwise, these are fantastic biscuits. Tried these today due to a desire for an egg n’ cheese breakfast sandwich. I subbed tapioca starch for the potato starch. They look great right out of the oven, even if they fell and spread a little bit. They taste buttery and salty. Nice outer crumb and tender interior. A bit of a “dusty” aftertaste, but best GF biscuit recipe I’ve made. My daughter has a coconut allergy and wondering which “milk” or other liquid to use in place of coconut milk? Hi Jamie! I would probably recommend almond milk in place of it. Would I still need to use the potato starch if I sub out almond flour for Bob’s red Mill 1:1? I’m not sure! If you give it a try, report back on how it goes with Bob’s Red Mill. Good luck! These are so simple and delicious! I also think the dough is great that I am going to try and use it as a base for lemon bars (minus baking powder). Wondering if it would be possible with homemade almond milk or breast milk instead of coconut? My allergy ridden baby can’t have coconut. Hi Karen! Yes, another milk or non-dairy milk should work fine. Today is the second time I’ve used this recipe to make biscuits. They’re amazing! I haven’t tried it with the sugar option yet, but maybe one day. I like them as is! The first time I used almond milk bc it’s what I had on-hand and shortening. They were good. This time I used Earth Balance (Soy-free), full fat coconut milk, adding a splash of ACV, then, cutting the salt to 1/2 tsp, and they turned out amazing!! Thanks for posting a great recipe! I read the comments and thought weird people having gravy with biscuits (cookies to you)! I avoid all coconut products because of the ethical issue with people using monkeys to harvest coconuts. Did you test this recipe with almond milk? I would like to try it! This recipe looks wonderful, especially to top a vegan pot pie! !….however my husband is unfortunately allergic to potatoes (as well as has Celiac disease) any other starch that could be substituted for a similar result?? I always love your recipes, thanks so much!! Hi! Yet another question: could I substitute your gluten free flour mix in place of the potato starch and the almond flour? I was wondering if I could substitute coconut flour for almond flour. I’m aware that coconut flour is extremely absorbent, so if I were to use coconut flour, would I use a little bit less than the recipe required when using almond flour? These are the BOMB! My family was freaking out! We had them with honey the first time and today, as biscuits and gravy! The flavor of this biscuit is spot on. Thank you for your awesome recipes! I used the Miyokos butter and arrowroot powder. Yum! We are so glad you and your family enjoyed them, Julie! Could I use cornstarch, tapioca starch, or arrowroot instead of the potato starch? Hi Emily! We haven’t tried with this recipe and can’t say for sure but if you experiment with it, report back! Good luck! These are absolutely delicious and turned out wonderful. My significant other loved them and inhaled them as quickly as I did. Unfortunately, I did have to sub out the potato starch (two of my local grocers don’t carry it) for coconut flour. I used 15% less of the coconut flour than what your recipe called for and I couldn’t be happier with the result. Thank you!!! We are so glad you enjoyed them, Megan! Sorry, I’m not sure where to begin with suggestions there other than a potato and nut-free GF blend! Looks amazing! Is there something I can sub for almond flour? My son has an allergy. The almond meal is pretty central to this recipe. But I suppose you could try a blend of potato starch, cornstarch/arrowroot, and another light GF flour? this new recipe is superb. a tremendous improvement (and I loved the old ones!) enjoying these with some vegan country gravy. thank you dana! Hi Elizabeth! I basically swapped the GF flour for potato starch, and used vegan butter instead of coconut oil. Try that! That’s so funny – I found this one to be such a big improvement! I didn’t have high hopes as I’m new to gf baking and thought you needed gums and what not, but these are so great! I made these last night for my daughter, who we recently learned may have Celiac’s. I used Bob’s RedMill GF Flour. They did not look at all like the photo -but Bob’s also has a different ingredient base (i.e., not rice). I also realized after the fact that I completely forgot to add the coconut oil (despite the fact that it was literally sitting right next to me on the counter). They came out ok -not fantastic, because they were so dense (see supra re stupid mistake), but definitely improved with almond butter or regular butter on top. I’m going to try again with a rice based GF flour blend and actually adding the coconut oil this time. Will update my comment afterward. Thank you for all of your GF recipes! Hi Vicki, I don’t recommend using that blend for this recipe. It tends to taste gummy and dense. Try our blend next time! TOTALLY satisfied my biscuit craving! These were FANTASTIC!! I made a batch that we quickly devoured, so I made another batch an hour later! I did double the recipe the second time so I could make bigger, fatter biscuits. My picky girls loved this. They’ve been eating your Best Damn Vegan Biscuits for a long time and this morning I tried this. You’re a superstar. Thanks for all the recipes. I love this recipe! I have tried so many gluten free biscuit recipes and they were all failures. This one is the best, my whole family likes them! I am not vegan so I do use butter and buttermilk. Thank you for a wonderful recipe!! We’re glad you enjoyed these biscuits! You are a baking genius! I made these & they are delicious! :) I will no longer use my other recipes…for this is far better than any of the others I have tried. I made your recipe exactly as written. I used unsweet almond milk & Earthbound butter (frozen). Thank you so so much!! :) God bless you Dana! I made these yesterday for brunch. They are wonderful! Sent the recipe to my daughter this morning. My granddaughter has food allergies, she just asked my daughter if she would ever be able to eat bread again. She can eat this!! Thank you. Made these for the second time tonight. Flavor: delicious! However, like several other commenters, mine didn’t really fluff up, more the firmer disc situation. I halved the recipe an it made 4-5 small biscuits. Will make again because they paired really nicely with the lentil sweet potato sheperds pie. Thank you so much for this easy delicious recipe. BEST version of a GF vegan biscuit I’ve made yet! (And I’ve tried several recipes!) Ate them up too fast the first time – will have to make a double batch the second go around. Thanks for this recipe! I was really excited about this recipe, because I was craving (gluten free) biscuits, and they turned out DRY. Like really, can’t pick them up, crumble into piles of sand, choked on the first bite, dry. I followed the recipe really carefully, but everyone else who’s done it seemed to have success, so I don’t know what I did wrong. I’m really disappointed…! I made this recipe to the “T” and it was so dry it wouldn’t hold together. No “sticky dough” as the recipe suggested. Does the climate or weather affect this? Hmm, it sounds like you didn’t add enough vegan buttermilk. Try doing that next time! The dough should feel tacky. these are fantastic! I made these and they were really good. I want to take more to bring with me on a trip this week. Thank you! I’m also thinking – these could be good pecan sandies with a little sweetness and pecans? That sounds like a fantastic idea!! Can you replace fat with flax or applesauce? Hmm I am not sure that would work. If you give it a try though, report back on how it goes. I tried so hard and made these “by the book” but after two tries I give up! Mine look the same but they taste just awful. Should have tried them before Christmas dinner. Kiki, sorry for the delayed response. Did you by chance use a different flour blend here? That’s likely why they didn’t turn out. Instead of corn starch, could I sub potato starch or tapioca? We typically stay away from corn, I know there is a small amount in the baking powder, but I do not have plain corn starch. Hi Elese! We have not tried either of those subs but if you do, please report back on how it goes! I’ve made these several times, both the wheat-flour and the gluten-free flour minimalist baker recipes, and both are delicious! I’m currently obsessed with the gf one. It’s a holiday staple. Thank you! 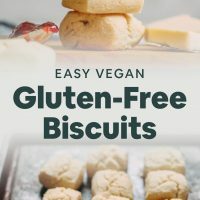 She has another awesome recipe for non-gluten-free people called Best Damn Vegan Biscuit… I’ve made them before and they are wonderful! I’ve since developed a sensitivity to gluten, so I’m excited to test this GF option out for Thanksgiving tomorrow. Hey. I’m so excited to try this recipe, however we are not gluten -free. Can I just replace with regular flour without making any other adjustments? Just made these biscuits. Very tasty! Serving with vegan/gf pot pie soup! Also, I doubled the recipe and it worked fine in case anyone is wonderingly. Thank you for the wonderful recipe!! These were so simple & delicious. They are husband & 9 month old approved! I used Bob’s Red Mill 1:1 GF All purpose flour & used all the liquid. I will make them many more times. I made these biscuits over the weekend with earth balance, Trader Joe’s gluten free all purpose flour, raw almonds processed in my food processor, rice milk, and all other listed ingredients. They came out of the oven looking amazing, but they were inedible. They had this awful bitterness to them. Despite my warnings my friends tried them only to end up spitting them out. I’m unsure what could have caused this. Was it an ingredient I used? Definitely due to the TJ’s all purpose GF mix. I don’t like their blend. Try ours next time! I was excited to find your gluten free biscuit recipe, but I’m allergic to almonds. I can use cashew milk, but is there another nut flour I can use? Haven’t been able to find an alternative. Hi Chris! You could try oat flour! I have made these twice – the first time with a store bought GF blend and the second time with your GF recipe. Both times they ended up looking quite anemic, not at all golden like yours. The taste is great but the look is not so good. Any suggestions? I had the same problem. Mine weren’t golden either. My batter was also super wet, even though I only used maybe 2/3 of the liquid (I added more of the gf flour mix to compensate). I’m going to try a different brand of almond flour next time (I used Bobs from whole almonds and it’s not my fave) and put them closer together on the sheet. Any other trouble shooting tips? This is my first time trying to bake gf. these are soooo good! i used bobs red mill 1:1 and miyokos cultured butter and they are so amazing! fluffy and flaky i just ate 4 for breakfast with gobs of honey on top and i am in heaven! oh ya and they are so shockingly EASY! Hi Dana. I love so many of your recipes! A good friend of mine recently discovered she is Celiac and she loves bread. I am hoping to make these GF biscuits for her and shipping her them and some jam. I am in CA and she is in Austin. How long will these biscuits stay fresh? I’m trying to make sure I can time it right and that it’s worth it to ship them to her. Hi Becca! They should last! I would recommend making them, let them cool, package them and then send them express! I have made these twice now… so easy and so TASTY! My entire family loves them. I can whip them up in the morning before school for breakfast they are that easy! Thank you! Am always really excited when i receive your newsletter but this time i wanted to cry ! Thanks a million for your wonderful recipes ! These were delicious. Thanks for the recipe. Oops, if I had read this on my laptop rather than my phone first I would’ve seen you specifically outline all the above already! Apologies! I was pleasantly surprised by these biscuits! I have become a little wary of gluten free baked goods but these were really great. A little more tender than regular biscuits but otherwise very similar to gluten biscuits. Thank you so much for this great recipe! hi,,thanks for sharing your blog! keep blogging! This is a truly delightful treat which I am willing to try soon, Dana. Can I use coconut milk instead of almond milk? Success! Made these babies using Bob’s Redmill 1:1 GF Flour and they came out perfectly! Moist yet crumbly and perfect on top of Dana’s Vegan Pot Pie recipe. Hey Samantha ! I realize this post is a year old but I was wondering which ingredients did you sub the Bobs 1:1 for? 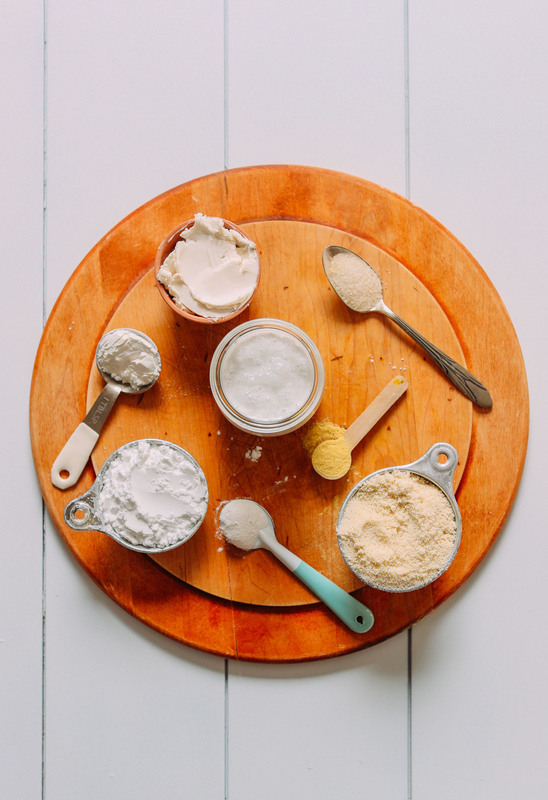 The potato starch, corn starch and almond flour or just the almond flour? Thanks! I only used the Bob’s Redmill GF 1:1 Flour. I didn’t substitute anything for it. I remember the recipe turning out great! Good luck! Uh YUM, I made these babies today as a side to our soup for dinner and they turned out really well. My only regret is that I didn’t double the recipe so I would be able to have a jam/jelly/honey situation with these biscuits in the morning. MB crushes it again. Elizabeth, most vegans don’t like to consume GMOs because they are created using human and animal DNA, thus making them not vegan. I don’t eat them because they aren’t real food and thats a fact. OMG YESS! We made these biscuits today and they are the BEST BEST BEST gluten free biscuits ever! So tender and flaky, yet they held together beautifully. And the flavor was incredible! I used the Miyoko vegan butter instead of coconut oil and they were divine! Thank you so much Dana for posting this, I wish I could give you 10 stars on this one! And I have a question about this recipe: is there a sub for the gluten-free flour mix? I can’t eat any kind of grain. thanks. Oh thanks. I finally clicked on your link for the gluten-free flour blend — my apologies, I thought this was some prepared food. Didn’t realize it was a DIY! Potato starch and tapioca flour are things I can eat, and do use in baking. So the rice flour is the only problem. I’m guessing the white rice flour is finely ground — it looks so in the photo. I’ll do some research on rice flour. I have cassava flour in my pantry, which is also very fine grind, maybe a sub. Thanks. There is a lot of misdirection in this comment. In other words, Elizabeth Grisham is trying to direct you to the studies that have been done on GMO seeds, which have been largely inconclusive, instead of having you look at the studies on the toxic weedkiller that is nearly always paired with GMO seeds, which are conclusive: GMO weedkiller (usually glyphosate) causes cancer. That’s why the European Health Organization banned it. The “M” in GMO stands for “modified” and the modification in nearly all cases has changed the plant to tolerate huge doses of weedkiller. That’s done to increase the farmer’s profit, because pouring buckets of weedkiller onto the corn makes it easier to harvest the plant and keeps some of the bugs away. They don’t seem to mind that the corn happens to be your food, which you put in your stomach, and in your kids’ stomachs. Don’t be fooled by Elizabeth Grisham, who is almost certainly a robot that was programmed to make comments like this on food sites, not a person. You may be correct ! I notice this Elizabeth “person” hasn’t responded to any comments. ??? Probably not programmed to do that ? Can you really skimp on the fat in biscuits without altering the texture of the doughy and fluffy treat? I personally don’t think so, hahaha! Is there a substitution I can use for almond flour? It’s pretty expensive to find where I live! Perhaps a blend of more cornstarch and GF blend? Hi Cassie! How about oat flour? Hi these look soo good. And I love that they are both vegan and gf.. but I don’t like to use gf flour. Can I use 2 cups of almond flour instead?? It’s worth a try! Let me know if you try it. oh my – there is plenty of science and scientific opinion that is against GM if you look. Oooooh. GMO’s make people sick. This is FACT. Its banned in most countries. Whatever Monsato paid studies you have read are lies. Its crazy with all the info out there at our finger tips that there are still so many blind to the truth around food in this country. These sound awesome! Question — my son has a nut allergy. Would oat flour or chickpea flour work in place of the almond meal? Great recipe! Wondering if I could use sweet rice flour for the white rice flour? Or perhaps more brown rice flour? Thanks for all you do! Yay!! Can’t wait to make these! I feel like they would be amazing on top of your Vegan Pot Pies! Do you think using the Bob’s 1:1 GF Flour Blend would work well here? I think that would be tasty! I haven’t tested it with the 1:1 blend, but let me know if you do! Bobs 1 to 1 worked great for me. Used with Earth Balance. Hi! Did you use the 1-1 flour to sub for the almond flour and her gf baking mix? Meaning if I don’t want to use almond flour, could I use the bobs 1-1 ? Amazing! Do you have any ideas oh what to pair this with? Everything! Apple butter or pear butter would be amazing! I’m planning to use these to top little vegan pot pies! Smart! These are lovely with just about anything. Vegan butter, jam, alongside chili, or with pot pies! These sound and look so yummy! EEEK, yazzz!! I am making these this weekend too! PLEASE DO MAKE A GF burger bun recipe!!! These look amazing! I’m definitely make them this weekend with a mushroom gravy mmmm. Will add that to my list! Any chance you can post the original recipe? I loved it and the altered one has things in I don’t like to use. Oh, no! My family and I love that recipe, I use it all of the time, and I was just about to make it. Please repost! I agree! Please keep the old one too, it was a favorite! I agree ☝️ thank you! Have you found or able to recreate the original recipe? I came on here to make them and we are so disappointed the recipe was removed. Thank you!